Opening Lines: Little Owl’s mummy had some very exciting news. She had laid a beautiful egg. Synopsis: From Amazon – I’m your baby owl. You don’t need a new one. Little Owl isn’t pleased to hear that there’s a baby owl in the egg Mummy has laid. So Mummy pretends it might be a baby penguin …or crocodile …or elephant. In the fun of imagining different kinds of siblings, Little Owl realises that a baby owl might just be the best thing of all. A gentle, lovely story about the arrival of a new sibling, addressing fears that Mummy’s love will stop. Why I like this: The beautiful cover, of pop-eyed cute owls looking at the new egg in the nest and the title of the book in gold lettering, screamed pick me, pick me. The full page illustrations are gorgeous, bright and expressive. Little Owl becomes fearful his mum will not love him as much when the new baby arrives. When she talks to him about what the new arrival might look like his imagination runs away and soon teaches him that a baby owl will be the best thing of all. I loved the way the text first has Mum suggesting what the new arrival might be and then the role is reversed with little owl suggesting what the new arrival might be. (a kind of reverse psychology) Very cleverly done with an aww… ending. 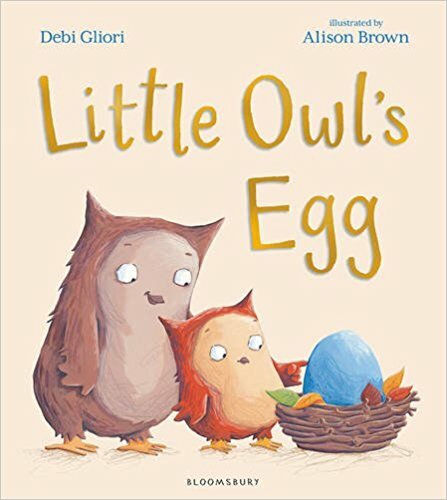 Debi Gliori is a bestselling author/illustrator of over 75 books for children, including the bestselling No Matter What and the Mr Bear series. She lives near Edinburgh. This entry was posted in Perfect Picture Book Review, Picture Book Review and tagged Debi Gliori, new arrival, Perfect Picture Book - Friday, sibling rival, siblings, Susanna Leonard Hill. Bookmark the permalink. What a great book for kids expecting a new sibling. This would be perfect for my great grandson who’s expecting a baby brother in June. He’s been the center of his parents world, so this will be interesting time for him. Thanks for the suggestion. Hi Pat, yes this would be a great addition to his reading with a new arrival expected soon. It will help him realise that a little brother is not such a bad thing after all. Congrats on the new little grandson soon to arrive, Pat. This is a cool take on an old story. Those owls are adorable. Yes it is a beautiful story and the illustrations are just adorable, all right! Thanks for being here Joanna. The owls are adorable and it is always fun to find a new take on impending siblings. Thanks for featuring it. You’re very welcome Maria. Yes this is a lovely new look at the impending arrival. Great for little kids who are anxious. I love books featuring owls and my great granddaughter absolutely loves them too. This one looks adorable and I like the message. Hope all is well down under! !